Japanese auto maker Isuzu Motors today launched a multi-utility pickup truck targeting small and medium entrepreneurs, which will be priced in the range of Rs 7-8 lakh. The company, which unveiled 'Isuzu D-Max Space Cab', will assemble the vehicle at the Hindustan Motors facility in Tamil Nadu in the next few months. "In India, the pick-up truck segment is one of the largest and fastest growing segments in commercial vehicle accounting 35 per cent of the total commercial vehicle markets. "With the growth in the Indian economy, We estimate India to be the world's largest pick- up truck market by 2023," Isuzu Motors India President and Managing Director Takashi Kikuchi said here while launching the truck at the 12th auto expo. The vehicle which will be powered by 2.5 litre diesel engine will be available in the company's showrooms across the country including Delhi. Currently, the firm has nine dealerships, which it aims to take it to 60 by 2016. Kikuchi said that cargo and equipment like power tools, hardware and electronics, perishable cargo can be safely carried in the vehicle. Besides, the Japanese firm also showcased its sports utility vehicle MU-7 and pickup truck D-Max here. Isuzu Motors has already started the construction work of its Rs 3,000-crore manufacturing facility in Andhra Pradesh, from where it plans to cater to both domestic and export markets. The company is likely to commence commercial operations by early 2016 with an initial production capacity of 50,000 units per year. The production capacity of the plant, which is expected to generate 2,000-3,000 jobs, could be scaled up to 1.20 lakh units per year. "After the new facility (is completed), we will make Isuzu D-Max Space Cab at the company's Andhra Pradesh plant. This vehicle will mainly help those customers who have their own medium and small size business," Isuzu Motors Deputy Managing Director Shigeru Wakabayashi told reporters here. By the end of March, the company will have presence in nine cities with exclusive dealerships in Chennai, Hyderabad, Coimbatore, Cochin, Bangalore, Tirupati, Vishakapatnam, Madurai and Delhi. Jaguar and Landrover showroom by VST Grandeur is to be set up soon in Madurai. Eager to know when the much talked about "AUDI" car dealership / showroom , is to be opened at Madurai. Forumers ,could anyone please inform about the status of preparatory work or infrastructure being done or so? It seems the economic slowdown is taking its toll. of late, we could not observe any new, big car showrooms , dealerships coming up at Madurai. it is a little concerning and disturbing trend. let us see if our vibrant, stable and resilient city tides over this phase and emerges ahead. Btw the native TVS group , if they convert the service outlet into a full-fledged Mercedes-Benz dealership, it would sure do well and also give a tremendous impetus in more Luxury car dealerships coming up here. very eager to see them around and our city buzzing with good business activity. Are plans afoot about any of the luxury car dealerships Mercedes, BMW, Audi, Jaguar opening up at our Madurai. Can someone update please. Meanwhile, to strengthen its foothold in the country, Volvo has announced new dealership in Chandigarh. The company currently has 13 dealers across India and has plans to add three more in the current year, which may be in Kolkata, Mumbai and Madurai. Although our City Madurai lags far behind in Industries and manufacturing sector, nonetheless it has been and is still a thriving, vibrant , commercial and trade centre. It is the hub of trade and businesses linking the rest of India with Southern Tamilnadu and thanks to a steady cash flow evident in the city,automobile trade is flourishing here, reason why more and more major automobile manufacturers are eager to start their activities here. already our city has been registering a substantial steady growth of sales in the Luxury and ultra-luxury segment cars sales, which is very exulting, indeed.just if our Madurai gets steady flow of investments and considerable industries, at par with cities like Coimbatore / Hosur / Trichy / Pondicherry , it certainly will surpass the second major city of Tamilnadu. also commencement of Automobile Sports club of Madurai, too will go along way in promoting a spurt in automobile sale here. any takers? where is the upcoming "AUDI" car dealership located at Madurai? can someone update please? 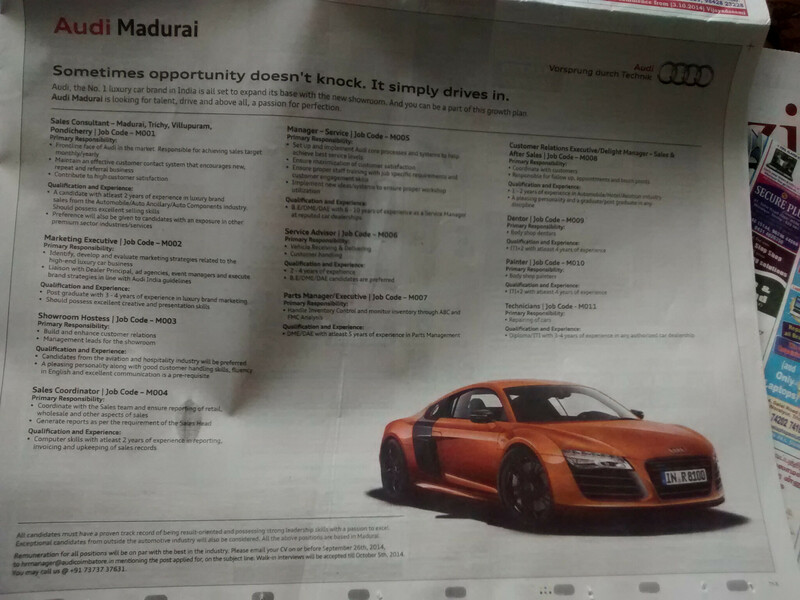 what about the "Audi-Madurai" dealership? no news emerging yet about its inauguration/ can someone update please? Any news about upcoming Audi/ Volvo showrooms at Madurai? Any progress or deadlock? so the fate of Audi showroom of Madurai is stalled it seems. Meanwhile A brand new BMW showroom from KUN exclusive is being setup near Neelambur,Coimbatore. Hope that it ll be opened within a month. Pity, whenever new ventures , businesses, enterprises want to commence their operations at our Madurai, they all invariably land into thick of troubles. prior to launching, there is much ado and apprehension, which has perpetuated amongst the businessmen and corporates , over the image and business culture of Madurai. this all needs to be dispelled. for this rapid industrialisation , is the only remedy. but i wishfully hope , slowly and steadily , some confidence will evolve and that will be the impetus for industrial, business growth development, good employment and a thriving economy. o.k one day soon, our Madurai too will have a host of Top end / executive automobile shgowrooms and see booming sales too. I yearn to see it realised.